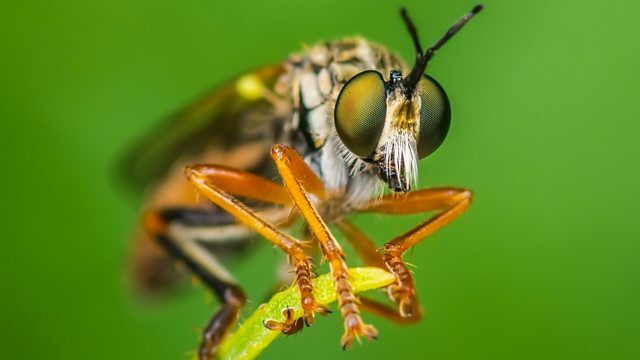 BBC World Service - Discovery, Killing Insects: The Rights and Wrongs, Do Insects Feel Pain? Insects such as fruit flies provide important insights into human biology and medicine. But should we worry whether they experience pain and suffering in scientists’ hands? Insects such as fruit flies provide important insights into human biology and medicine. But should we worry whether insects experience pain and suffering in scientists’ hands? Entomologist Adam Hart visits the Fly Facility at the University of Manchester where researcher Andreas Prokop describes the many insights that experiments on the fruit fly Drosophila have provided on aspects of human biology and health. Globally billions of these little flies have died in the pursuit of this knowledge. Should we give a second thought about the deaths of these creatures? Do insects have the capacity for pain and the experience of suffering? It depends which scientist you ask. Lars Chittka of Queen Mary University of London says his work on bumble bees suggests that we can’t assume they do not. Shelley Adamo of Dalhousie University in Canada is not convinced by existing arguments for insect consciousness. A pair of scientific sleuths answer your perplexing questions. Ask them anything!